Photo 6 – Closeup of #3 – detail of central birds & fishThese are tessellations, designs in which figures fit together like tiling. 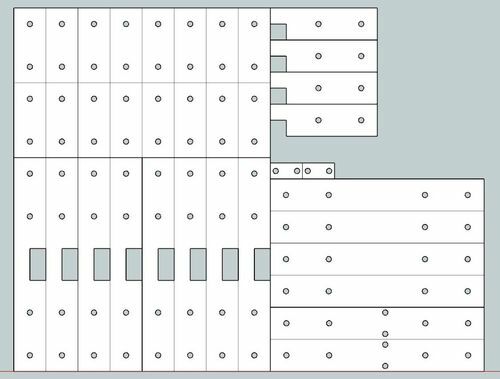 The figures increase in relief and detail toward the top & bottom of each design. The figures were cut out and applied to the background before carving. I made this plaque on a request from my cousin who will be giving it to the current Exalted Ruler at his Elk's Lodge at the end of her term. Should be a long lasting keepsake. Cherry wood has been working out well with the CNC. Finished with Natural Danish Oil. I took some pictures before applying the finish and some afterwards. this is a live edge walnut mirror that i made for my sister. She had a special spot she wanted to fill so i feel honored that she chose something I made. A friend bought his first house and wanted some furniture for his back porch. 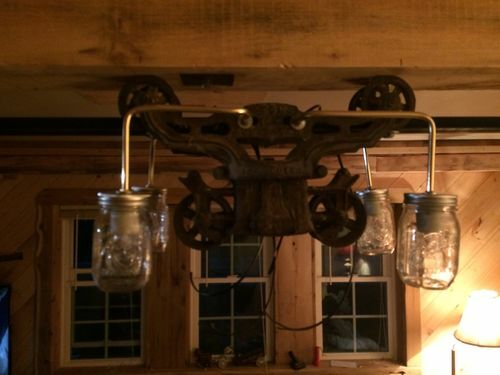 We drew this up based on some things he showed is that he liked.Used alot of treated pine 1*4s on this project. Added mahogany splines for strength and Decoration.If he ever gets cushions I'll snap another picture or two. These 'baby boxes' are just a treat for me to build. This one is for a friend's niece and her husband for their baby who was born in December. Jim chose walnut and maple and I found this beautiful piece of walnut and though the pictures don't show it well is almost has some reddish tones to it. The maple in the lid has some very nice curl to it. This box is going to Texas, hence the Texas theme with the star and state shape for 2 of the teethers. The rattles turned out beautiful, showing the curl in the maple! 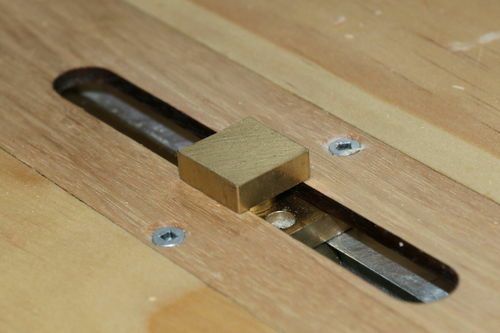 Mitered/splined construction with a brass pin hinge. 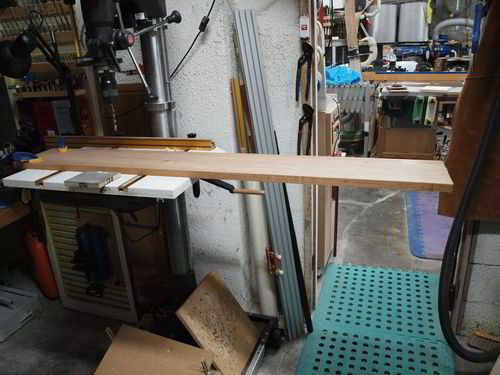 The mother/child is 1/4” walnut. I used an off-white canvas liner for the box and tray to lighten up the inside of the box and I think it compliments very well. It's finished with 7 or 8 or maybe more coats of wipe on semi-gloss poly and waxed. The rattles and toys are finished with a mixture of organic cold-pressed flax oil and organic beeswax.I hope little Henry enjoys his toys as much as I enjoyed making them :) And thanks for looking! End tables for my parent's bedroom. All walnut. 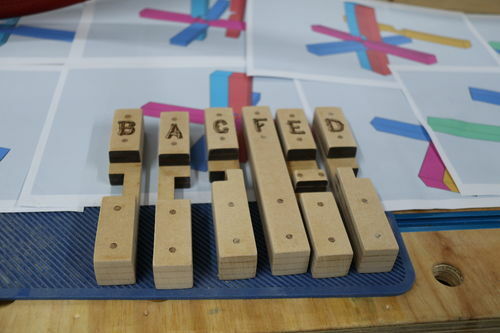 Constructing them was pretty easy. 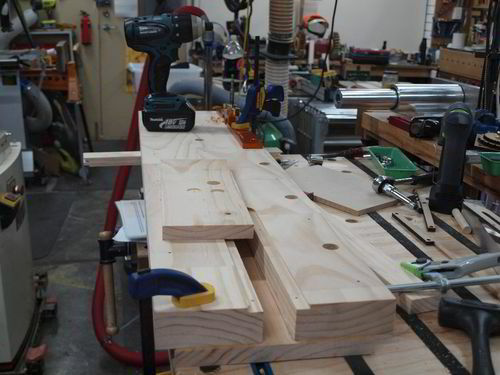 Cut some half laps on the table saw as well as a radial arm saw after I had glued up panels for each side. I didn't quite think about hanging them until late so I threw a piece of scrap purpleheart on top to hold it onto the wall. I also had to put some screws through the side to hold the solid piece of purpleheart. I was thinking about lacquer but ended up finishing them with boiled linseed oil and poly mix. I probably did a sloppy job on the hangar part of it but they're filled with books and stuff so I think it's perfectly fine as is. Since I've been on a family theme of projects here is the cabinets I built for my mother. The cabinets and vent hood were built from scratch with MDF and bead board using just a table saw, router and some hand tools. The microwave cabinet included a plate rack, bread box, cutting board, potato box and pan drawer. Some of my recent scroll sawn signs. I created the patterns with Inkscape software, then cut from 1/2” red oak for most of the signs. 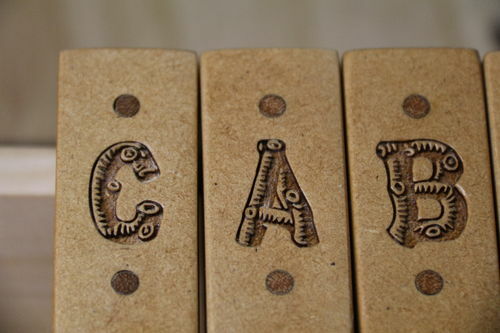 Boys and Girls,This is my take on what many authors refer to as a . 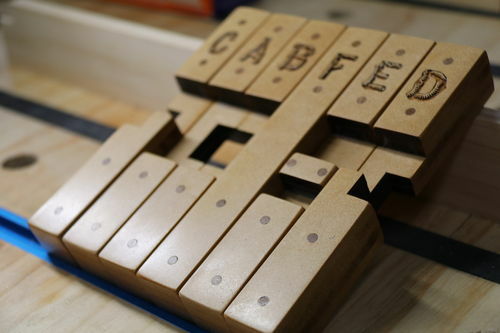 Now rather than be a sheep and follow in everyone else's footsteps, I will call mine a Japanese Puzzle.You can also use them to learn to count to F or even a starter Jenga set.A friend wanted something to make restitution with his wife for forgetting their anniversary. 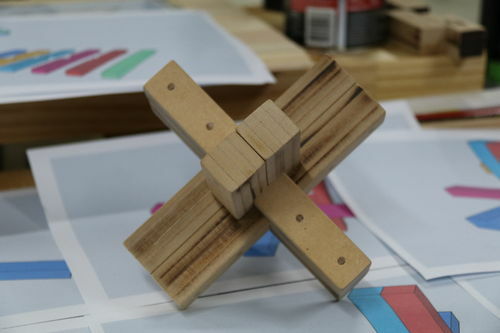 His wife is puzzle mad (well mad into puzzles not puzzling mad) so he asked if I could make him one of these Japanese teasers he came across in an Australian woodworking magazine. He wasn't concerned about the looks (the puzzle not the wife hmm?) and would have been happy with a 3D printed version (maybe a next project for myself) as long as it worked. After heated debates about the type of timber, we somehow compromised on MDF.While this project is presented with a laser cut MDF stunt double in the starring role, don't freak out if you don't have any MDF or even less if you don't have a laser laying around.All cuts/dados are straight lines with simple dimensional mathematics, so a tablesaw and/or dado-stack/router will substitute for a laser.While the original dimensions called for 15mm x 15mm stock, my laser will not handle timber much thicker than 7mm, so with minimal persuasion I chose to make the parts out of 6mm MDF laminations. 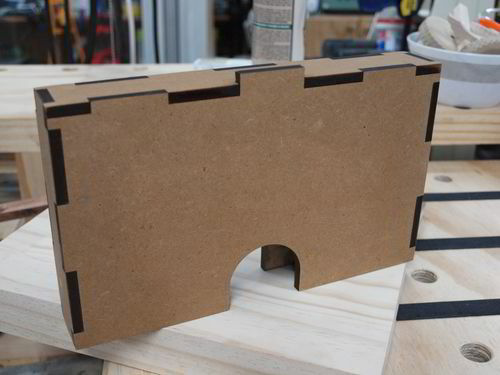 Now using all 10 fingers, for simplicity I chose 4 layers of 6mm MDF which worker out to 24mm x 24mm stock (4×6 = 24 even for large values of 6) more on this later. 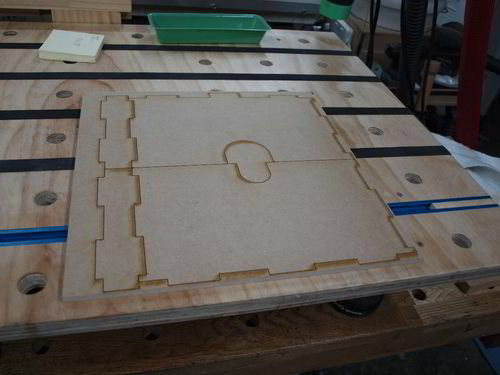 Now the measurements were ideal for cutting out of solid timber and should be relatively simple, however, I chose to laser it out of MDF.To allow for 4 layers of 6mm MDF, I had to upscale the original parts by 1.6. 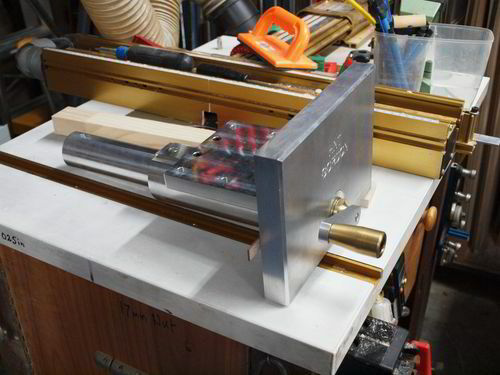 This made the length too long so after the 1.6 increase I shortened each end ( of each piece) by 40mm. 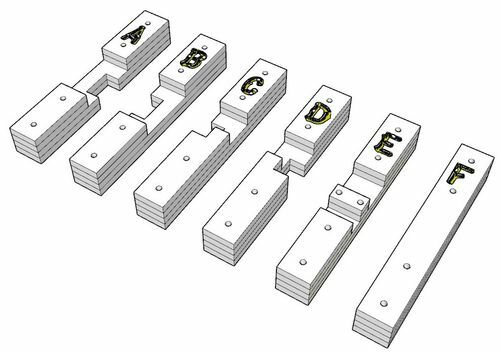 Part of this morphing process was to create a layout document with enough measurements to layout and cut on conventional machinery.While on the laser, I engraved a part number (well actually a letter) to identify each piece in case one needed to refer to the cheat sheet (solution). 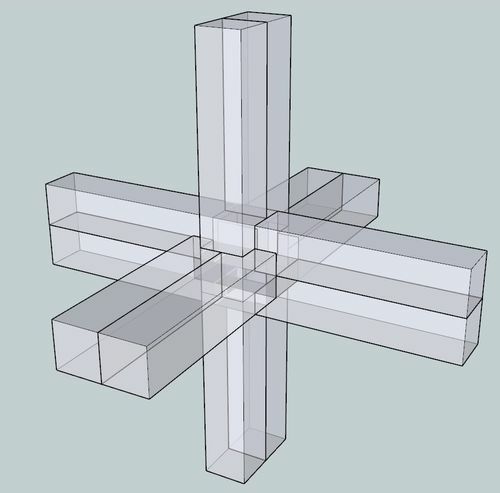 The letter were engraved on the inside of each part so it would not be noticeable unless you are either observant or Superman (welcome to earth Kryptonian). Tested parts compatibility and sanded/scraped any protrusions and glue squeeze out.Tried to assemble and even with the instructions it took longer than a timing that would make me proud. The friend started talking about a (Japanese Box Puzzle) to store this gift in I told him that I'll make him one for atonement if he forgets his diamond anniversary as he is recently married, I don't think I have too much to worry about!Did make a video... but only to prove that I know how to put it together….If you don't know SketchUp but still like looking at dirty pictures check this out and if you know SketchUp, the models can be downloaded from here. However, as always, SU provides a quick presentation for those that hate reading (so don't read the above) and have no intention of making one of these but curiosity got the better of them… GOTCHA!.And to think this was gonna be a short article? Dough-nut bowl turned from Black Marie 300 mm diameter x 140 mm high.Comments welcome. Years ago when I was a Park Ranger I built this 1” scale model of my Bounder 37' Motorhome for my grandson.I built it heavy duty so he could ride on it and it was fully furnished with a flip top so he could play with the inside. This was my first large scale model. I posted a few of these a couple of weeks back and have been experimenting with ply.What do you think? 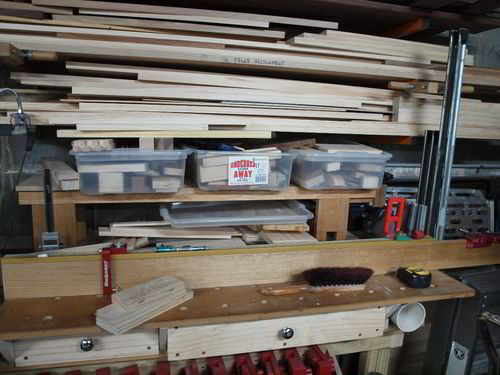 More space is what is required in my ever shrinking workshop, this cabinet of very standard 1/2 ply construction. 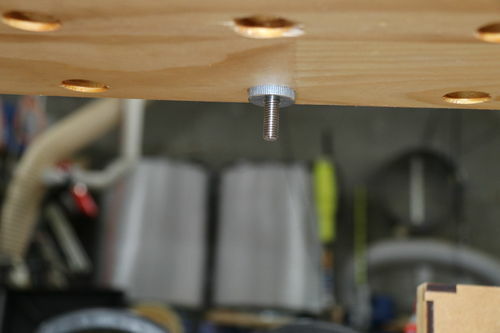 I also used it as an experiment for exposed dowels, which I learnt a lot about.The cabinet sits against the ceiling in my workshop and is just out of the way of head height walking space. 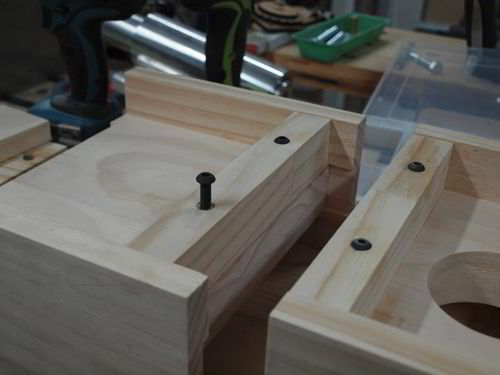 The drawers needed to be easily removable so as they could sit on the bench whilst being used. 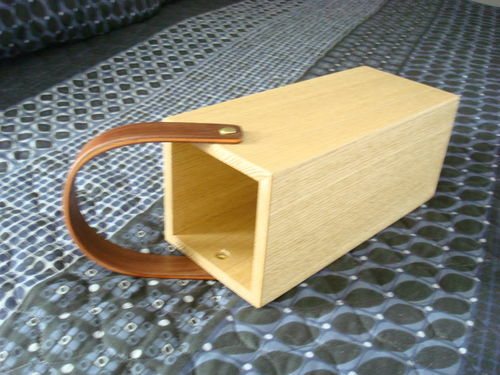 The handles had to be easily gripable to be able to pull a heavy drawer out and get it on the bench without dropping it down the stair well.The only real special thing here is in actual fact the hand made handles from Beech dowel and Mahogany ends. 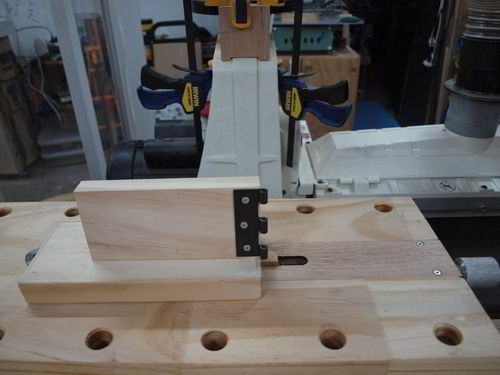 AnthonyThese two pics are of the jig required to get no tear out in the half inch holes of the handle ends. 2 of my close friends just moved into new houses, so I wanted to make them a house warming gift. 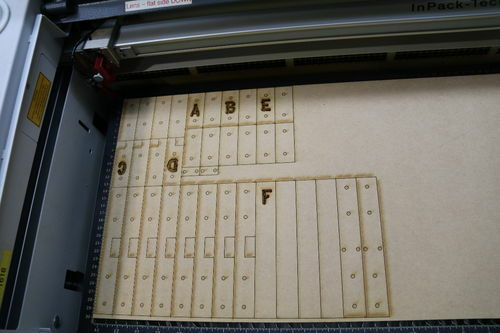 I also wanted to try out this new 3mm BB plywood in our laser engraver, so this seemed to be a perfect combination. The tops are engraved and cut on my laser, then I used a compass to trace an offset on the cross onto this piece of Walnut and cut it out on the bandsaw.After I realized how much that sucked to do (I was kind of on a time crunch), I came up with the thought of just an elipse. Once I finished cutting out the elipse, I thought it looked a little disproportionate, so I added the random routes along the border.For hanging purposes, I used a keyhole bit to route the slot in the back, then stamped it with the branding iron and sprayed a few coats of poly to add the shine.The last few pictures are of some shirts I printed today after school. My family and I are headed south for the week to take my 2 daughters (7 & 5 yes old) to Disney. Not only is it their first trip to Disney, its my wife and I's first time on a plane together. We're also going with my two parents, would hopefully all goes well. Wish me luck!Thanks for checking in, as always comments and feedback appreciated! 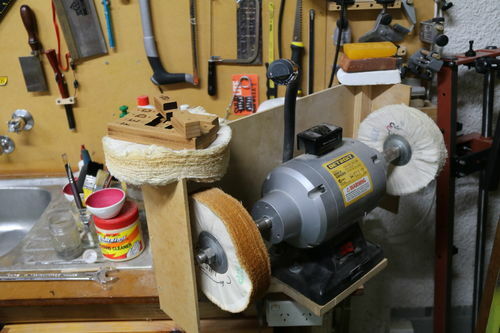 If you scroll a couple projects back you can see where this piece came from on that last bandsaw box. I knew when I cut that piece off it was big enough for another box so I saved it and finally got around to making it a couple months ago. Just now getting around to sharing it here. 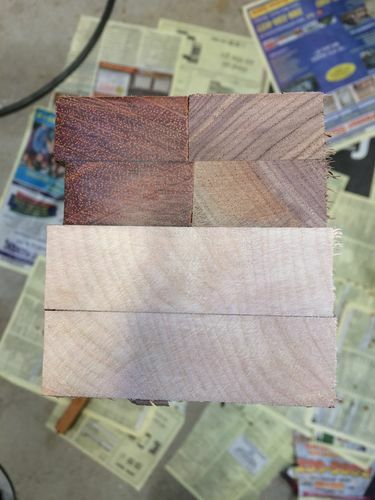 Again, it's Myrtle wood, Purple Heart and Yellow Heart. I have a ton of this beautiful Myrtle wood and it has gorgeous color and lots of figure, spalting,etc. I always flock both inside the drawer(s) and the drawer cavity as I did here as well. 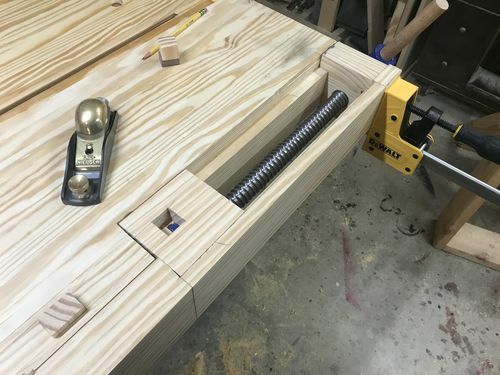 I decided to accent and emphasize the insert cut by not duplicating the curve on the other side and by highlighting the same curve in the drawer pull. Finished with Watco Danish Oil and called it done. Any questions/comments are always welcome. This was a project in FWW #269. Michael Pekovich did his box with wenge and birds eye maple where as mine is made from quarter swarm white oak and vertical grain clear Douglas fir. I had a board of q- dawn oak that had sat in a puddle some where and had darken considerably. I save it from the firewood bin at my local flooring store. I wanted a darker colour so that it would match the FWW one, so I lightly fumed with household ammonia. Colour didn't darken as much as I liked but it was enough. For the liner, I didn't have birds eye and again found some old growth, vertical grain Douglas fir in the firewood bin that I sized and selected the best grain for the inside. I finished with oli-natura hard wax project oil, a vegetable wax oil finish.A fun little project, although not having the power tools to get this done soon drew out the process by a month or two! I built 2 end tables because the ones I had were 30 years old and presswood construction. Wanted something to store, sort and have access to, other then stuffed in a box with doors. Made a slide out under the top to hold coffee, snacks and such while sitting. This saves the top for incidental clutter, that always winds up there. Makes cleanup (accidental spills, coffee rings) easier. 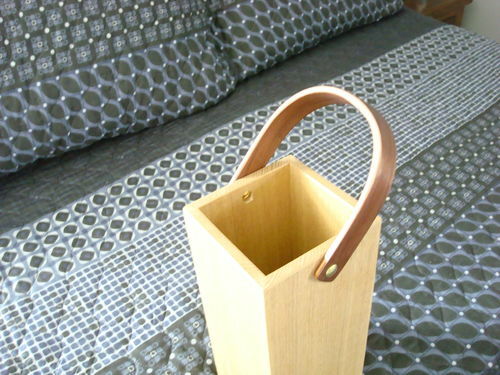 Also slides out to be a writing table on lap. Made with select pine, finished with shellac shacks ruby, garnet and patina shellac. Then coated with polyurethane to protect the finish better. Posting a few pens I have recently casted and turned. I used Palm Royal resin and cured in a pressure pot. Fun addition to the standard pen turning. Another 5 year anniversary gift, Birdseye maple with walnut ends and dowels. There is also walnut pieces inside that form channels for the flowers to sit into. The flowers are actually made of wood and died, I purchased those, no idea how to make those. The lighting was an experiment, they are temporary for know until I decide if I like it or not. I have made several of these truck throughout the years; this one being for a auction for my sons preschool.Base on the pattern out of Tremendous Toy Trucks, I used several woods.Wheels & pins are from lee valley tools while the cab is local Garry Oak. frame is Douglas fir, vertical grain, axles are cherry, trailer frame is teak, bunks are mahogany and the grill is wenge.Enjoy! Created from Teak, Curly Maple and a 2×4 cutoff. The grenade is fixed atop the flag permanently. 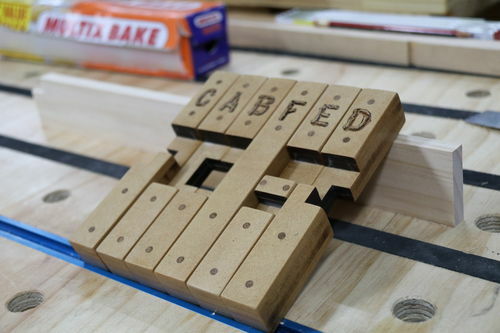 Here's a just completed version of the Federal tea caddies that are so popular lately. 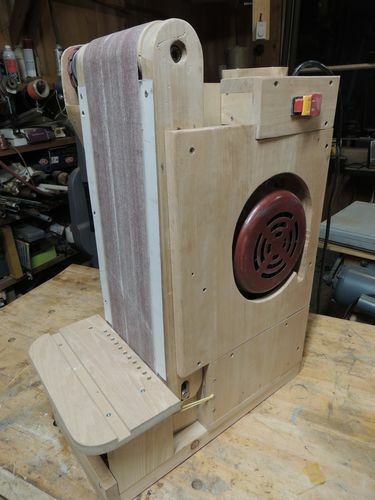 Built per Rob Millard's generous instructions, this is a pine box veneered with crotch mahogany and homemade bandings, stringing, and paterae of holly, mahogany, ebony, and dyed veneers. It's finished with hydrated lime, Trans Tint yellow and golden brown dyes, and shellac, rubbed out with 400g and 600g papers and 4F pumice. 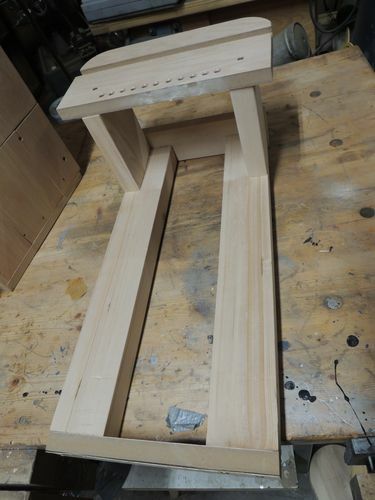 A friend asked me to make a stool as close as possible in Red Oak to what the last two pictures are of a stool her father made her with plywood and screws. No mechanical fasteners here just tusks and wedges. 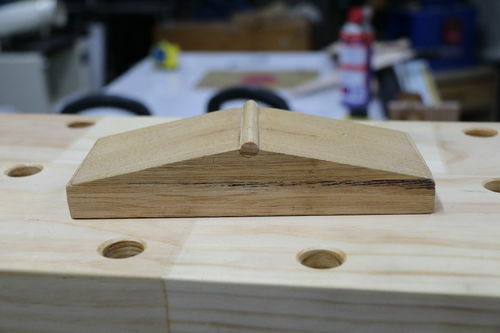 The angled mortise was a challenge by hand. She will stain and finish to match her floors. Of course she gets a cut off to test color. 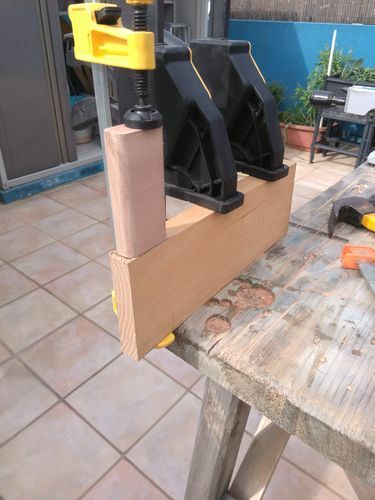 The French Mitre Saw—Scie Recaler Lumberjock theoldfart, aka Kevin, recently sent me his French mitre saw, or scie recaler in French, for restoration. His saw is old, and it rightly has the appearance of a beautiful antique. As soon as I saw it, I knew I had to make one. I ended up making three, and two of them are now listed for sale on my website. 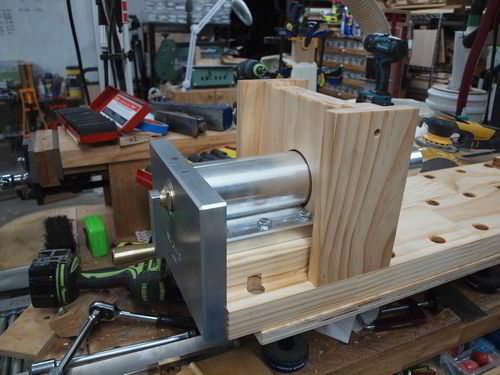 Below is a photo of Kevin's antique saw. When it comes to woodworking, the French have traditionally done things a bit different than their British or American counterparts. 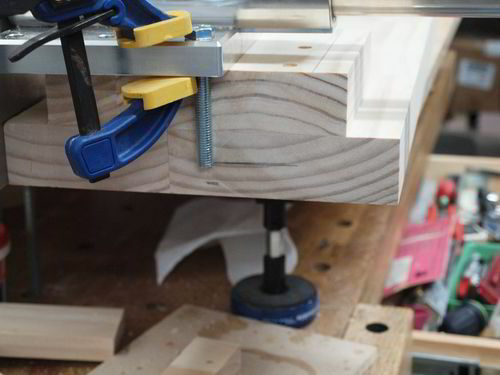 The standard use of frame saws rather than handsaws is one example. 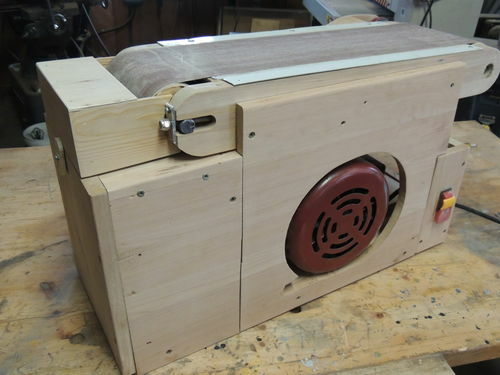 For cutting miters, instead of a miter saw and miter box they adopted the scie recaler and the boite recaler, literally the saw to recalibrate and box to recalibrate. 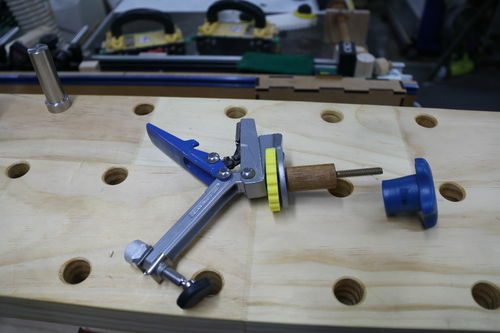 In that sense, recalibrate relates to sawing the desired angle. 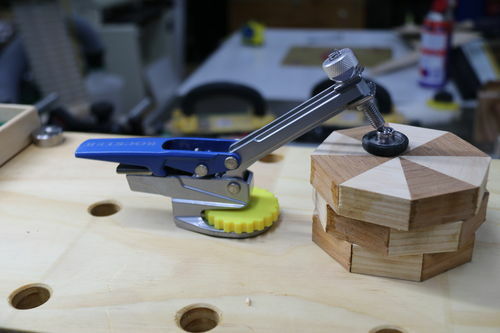 We call the boite recaler a miter jack. 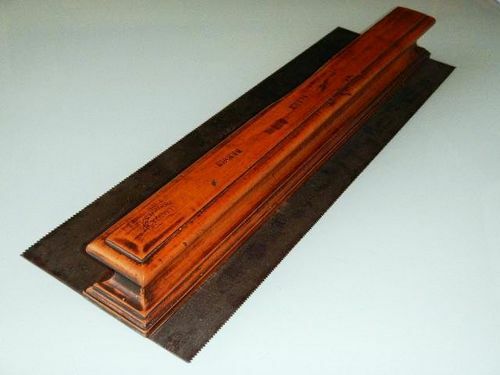 This type of saw can also be used to make 90 degree cuts in a device known as a flat jack. 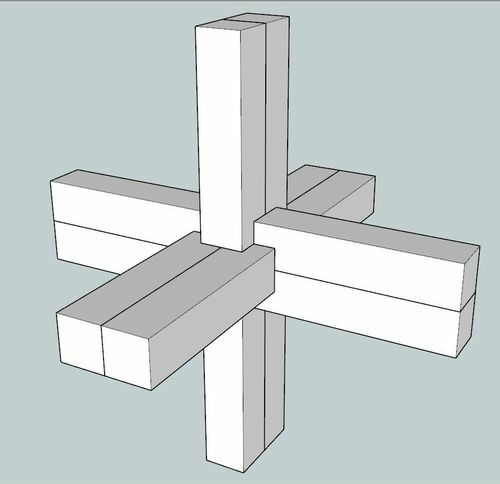 In the drawing below, the flat jack is on top and the miter jack is on the bottom. 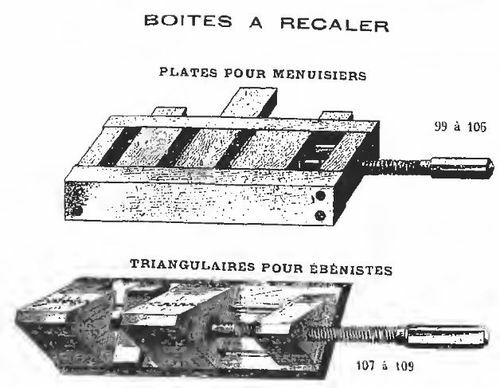 Both are called boites recaler. In researching scies recaler, I found they were all very similar with a few minor differences. Some have a handle profile like Kevin's, and some have a little fancier handle profile like the example pictured below. Also, some are single sided and some are double sided, with two toothed cutting edges, as shown in this picture. 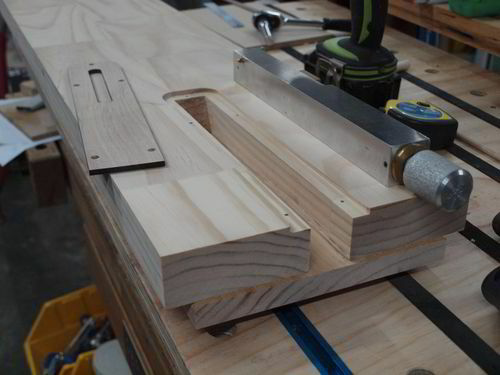 The three saws I made are all single sided with the slightly more elaborate handle profile. 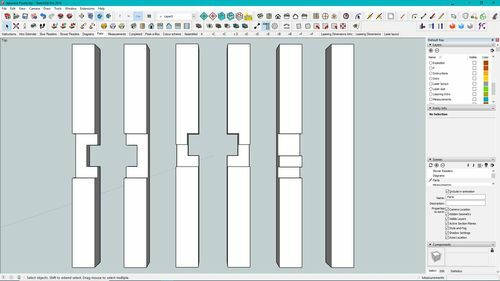 I made the saws in two lengths, two at 20 and one at 18. 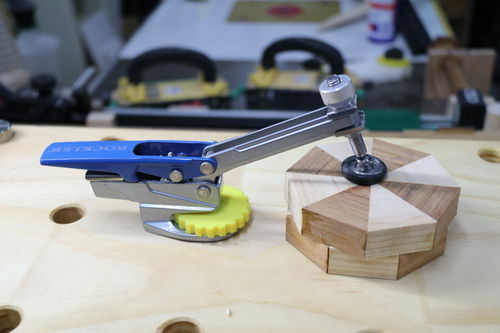 The 18 saw has a slightly thinner and narrower saw plate and handle than its brothers. 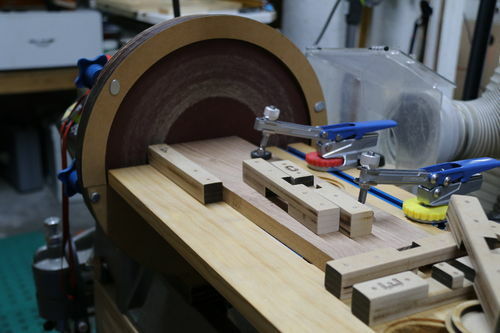 By comparison, Kevin's saw is 55cm or about 21-5/8” in length.A scie recaler has five components:1. handle - Kevin's handle, and probably most French-made handles, are of European beech. 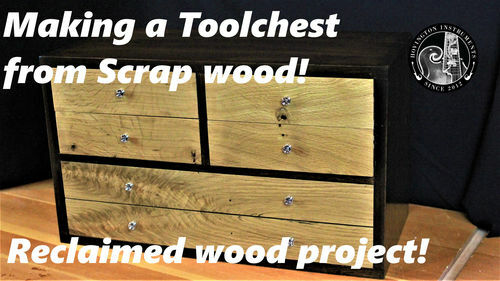 I made mine from cherry and applied a dark antique stain.2. saw plate - For the 20 saws I used 0.028 spring steel 5 wide, same as on Kevin's saw. I used 0.025 steel 4-1/2 wide on the 18 saw.3. 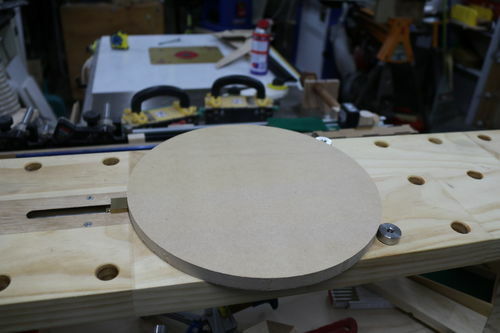 backing plate - I'm not sure of the correct name of this component, so I'm calling it the backing plate. 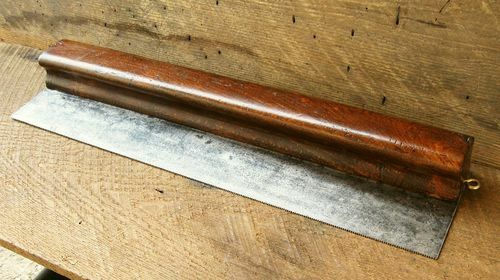 It is a strip of spring steel the same width as the handle, and the saw plate is sandwiched between it and the handle. I used 0.032 spring steel, which is the same as Kevin's saw.4. 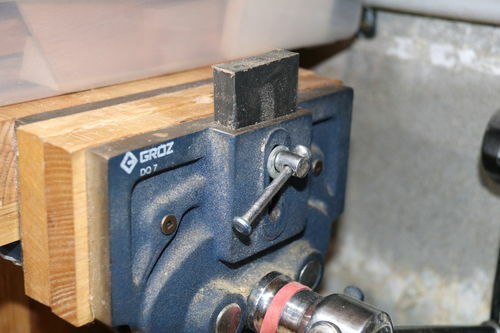 flat head screws - On Kevin's saw, and on my 20 saws, 12 slotted flat head screws are used to secure the backing plate and saw plate to the handle. On my 18 saw I dropped the number to 10. 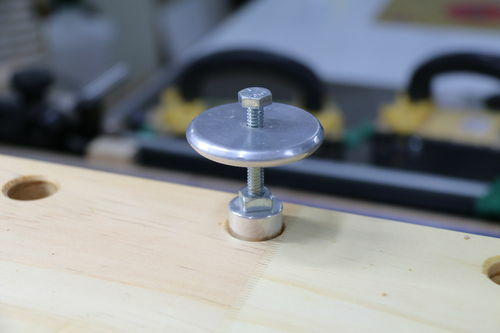 These screws are countersunk into the backing plate. 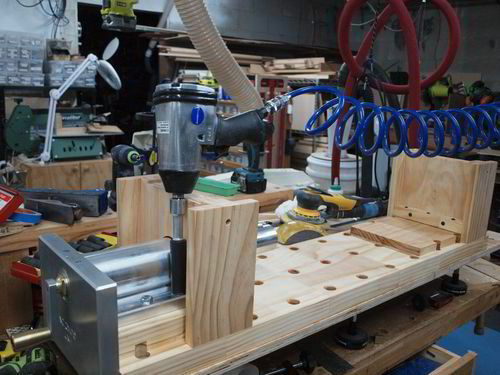 Originally on Kevin's saw, the screws were #4 steel screws. 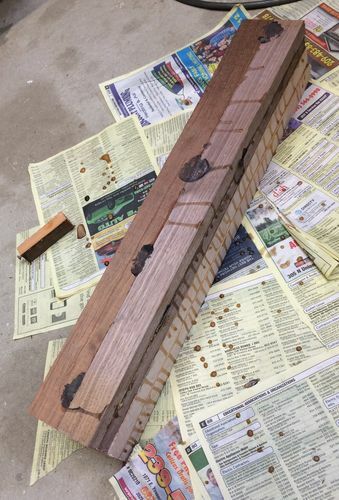 Some of the screws were missing, the threads on others were badly rusted, and the screw holes in the wood had become wallowed out over time. 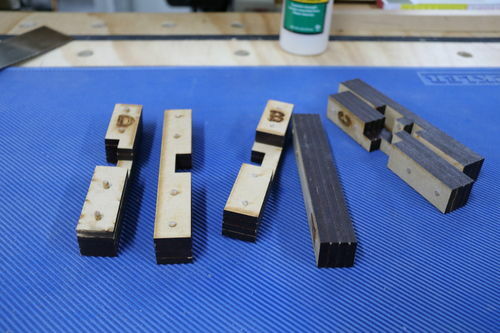 I replaced the screws with 5/8 #5 brass screws and used the same type brass screws in my saws.5. eye screw for hanging - In looking at pictures of similar vintage saws, I noticed that many had steel eye screws in the end for hanging. 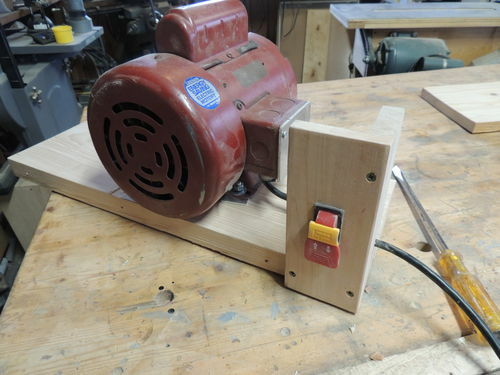 I think hanging the saws is a good idea because they aren't easily adaptable to a till, and if they're just left laying around, they will be subject to dulling from banging into other objects. Kevin's saw had three holes where the eye screw had been replaced at various times, but there was no screw present now. 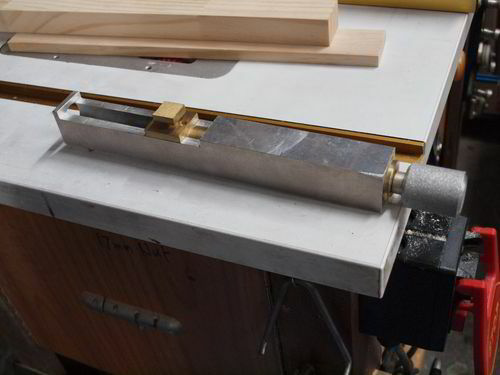 I replaced his eye screw and installed them on my saws, but I used brass because I thought it looked better.I'm not aware of anyone else in the world currently making this type of saw, so a new one is probably a pretty rare thing. Antique ones are not very plentiful either. I hope my three scies recaler remain attractive and useful for as long as Kevin's antique one has. I had this odd shape/sized piece of Claro Walnut that my buddy gave to me. I could see the amazing grain and figure so although it was shaped like a potato chip, I couldn't bring myself to get rid of it. I finally decided that I would sacrifice some of the beauty of the piece in order to at least have some of it useable. To celebrate my 2,000 follower milestone on Instagram I am currently hosting a giveaway, and this board as well as one of my t-shirts is my contribution to the overall prize package. 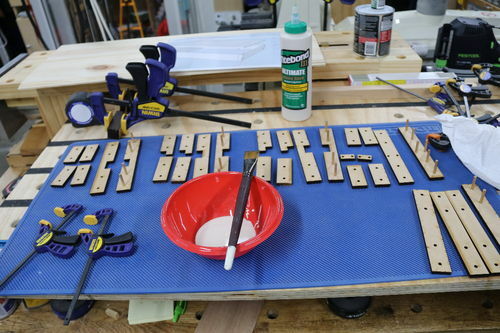 There was A LOT of epoxy filling to get this board to this point. The sapwood portion was crumbling due to rot and there was some beautiful spalting present to confirm on the piece that was scrapped. I chose to use shellac cut 50/50 with denatured alcohol to soak into the sapwood and help stabilize it. I then finished with Howard's cutting board oil and buffed it out. Though this board took about twice as long as I thought it would, I am very pleased with how it came out. I also am pleased that my brand came out so perfect for this giveaway prize as well. Any questions or comments are always welcome. Thanks for stopping by. Decided to make the wife a keepsake box for our 5 year wedding anniversary. Have had this piece of walnut that I been wanting to use for a waterfall box. The lid is made from some figured walnut that I had resawn as well as some figured cherry. The small trays and inserts are all made from the cherry and walnut used in other places on the box. It was fun to make something small and sentimental for a change. She loved it. This simple has been dragging on for way too long, but I have a project Ive started and need to finish this one.I started out digging through the wood pile and I found a piece of quarter dawn oak, 3/4 thick. 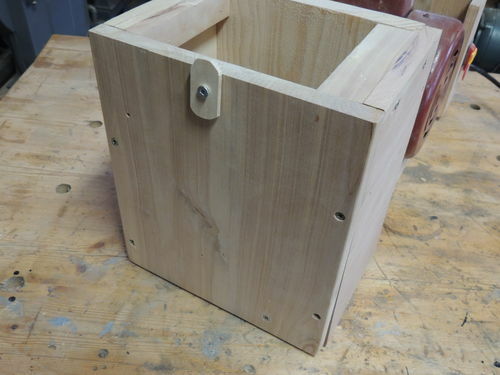 I roughed our the shape on the table saw…. then I put the project down as winter was approaching and I had to finish up Christmas presents first.After Christmas presents were done, I took a little time to dissect were to go next, so I took the factory insert screwed it upside down to the new insert, I then used my router table and a flush trim bit to cut it to the same shape and size to the factory. After that, I removed the screw and factory insert. 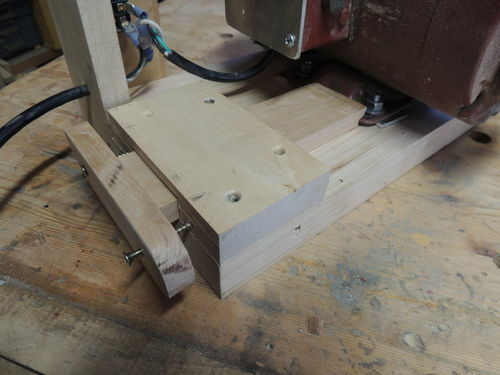 Using a Forstner bit and the screw holes I drilled out the recesses for the leveling screws.Fast forward several more weeks, I got back to my router table to cut out recess for the little itty bitty ledge on the table saw. 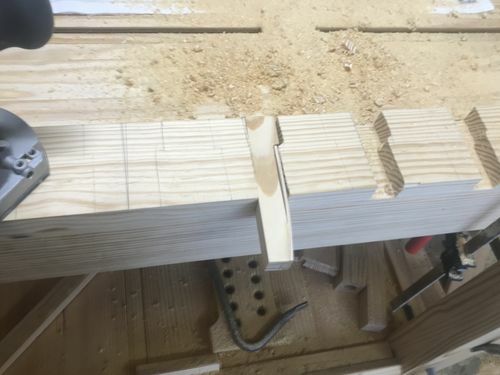 After that it was a little bit of free hand shaping using the router.I purposely left a little extra in the top side, so After all that I took the finished insert back through the planer to get the perfect fit. 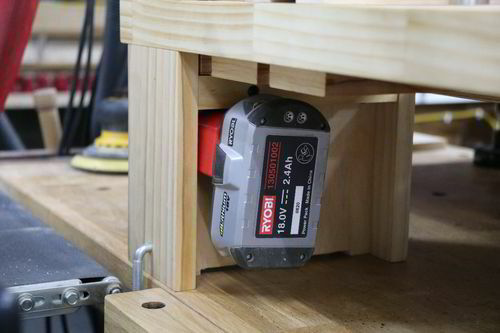 Tight little tool storage. ~10” tall top and ~12” tall bottom shelf. ~30” Wide, the magic number to be easily moveable/ modular.On french cleat. Small kitchen pantry from 3/4 in oak plywood with real red oak for the faceframes and door frames. 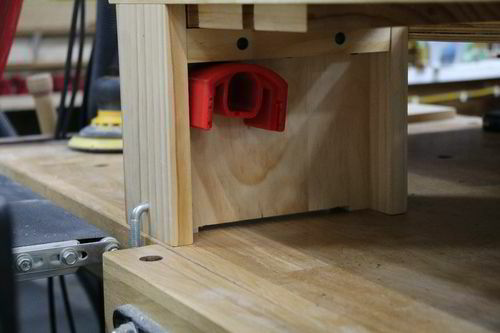 It also has adjustable shelves. 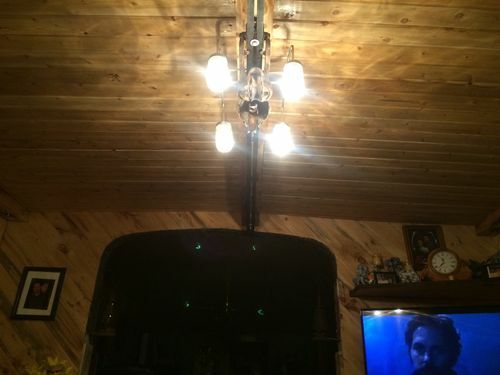 The last pic is in the customers home and I guess the light made it look totally different in the pic but the customer was pleased. 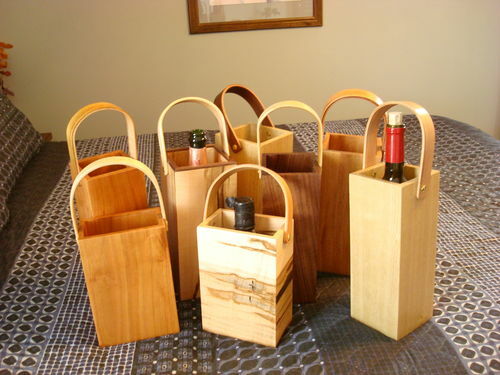 Reclaimed wood off-cut from larger wood projects. I'm almost sure this is some kind of New Zealand wood, maybe puriri. But it's very dark, even for puriri. It's almost certainly riverwood.At one angle the wood is so dark it's almost black. However, once you get it into the sun and turn it, it takes on a beautiful copper/bronze sheen.Inlay is cow bone. 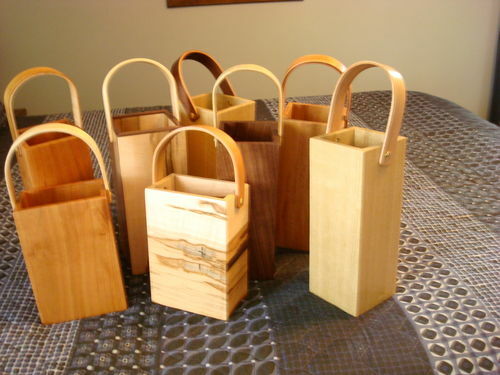 I tell people that I am a woodworker. 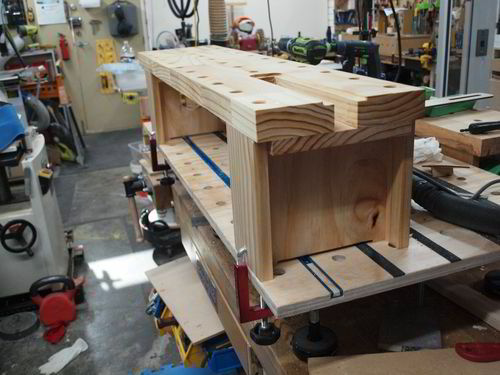 Sometimes, I think that my real hobby is a workbench builder who occasionally takes on woodworking projects. 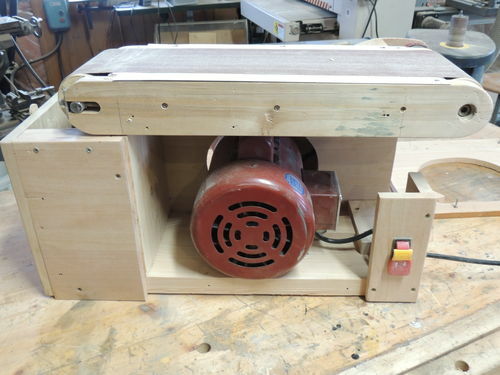 This Roubo is the 3rd – and hopefully last…- workbench that I have built for my woodworking addiction. 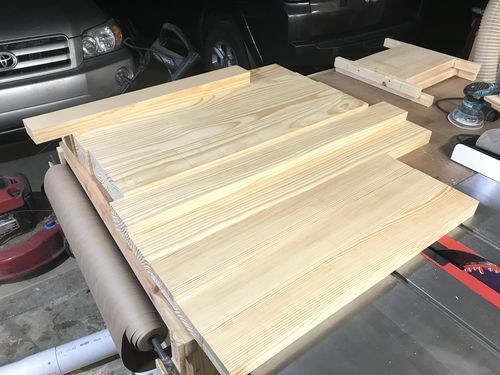 My first bench was built when my wife thought that she might still park in the garage again one day. It was only 4 feet long for space saving reasons. It had a 4 thick laminated top and was as ugly as it was strong. 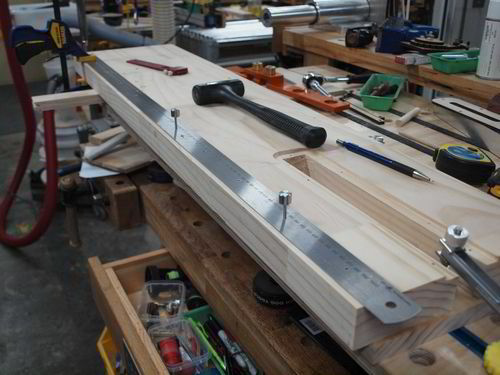 My second workbench was designed to be more of a looker than a workbench. At 5 feet long and with a 3 thick laminated top, it was larger, but not really very useful. 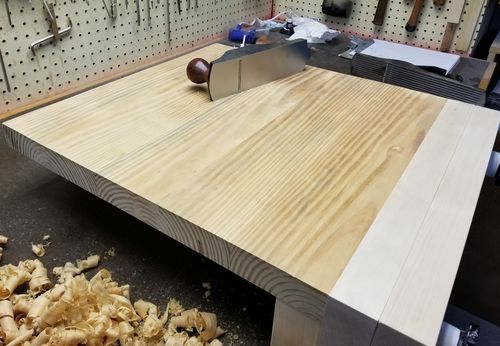 It was stained and had a padded on shellac top that was a ridiculous surface for any type of real work.Since the parking in the garage thing has gone away permanently, I decided that I could finally build a workbench that would be large enough to meet my needs, and be a bench that would be useful as well aesthetically pleasing. 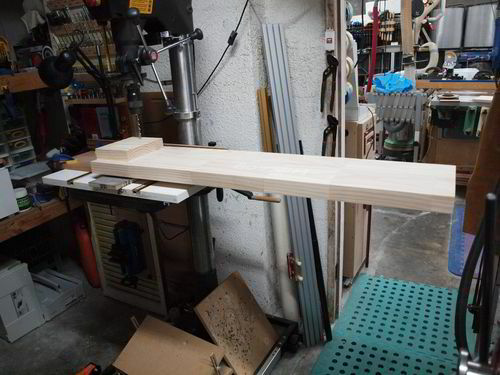 I ordered the Benchcrafted Split Top Roubo Plans and started designing, The plans call for a bench that is 87 long. I did not want a bench quite that long, so I cut my bench down to 79. 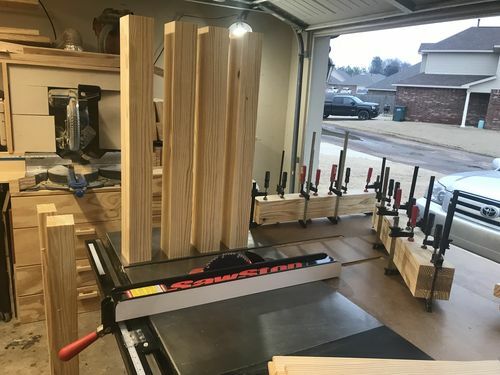 My intention was originally to end up at 78, but through fairly accurate clamping during glue ups, I did not need to trim much off the ends to even them up. 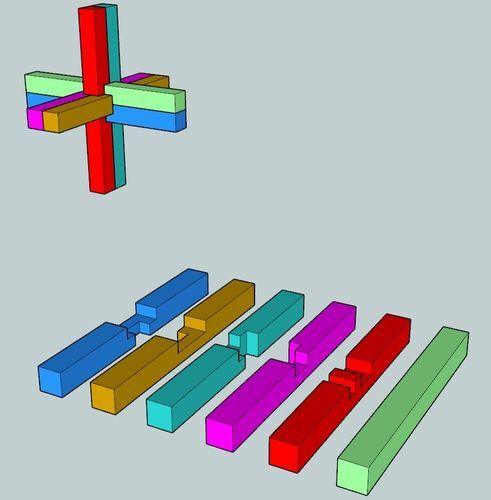 Also, the bench was designed to end up at 24 wide. 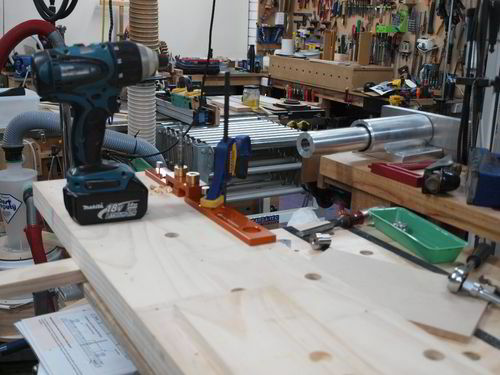 My first bench was 30 wide, and I really enjoyed the extra width, so I modified the plans to end up with a 30 wide top.I batttled with my choice of wood and hardware for the bench. The Benchcrafted hardware is incredible. I have never heard anything but praise for it, and at $700 I would hope so. I couldn't justify to myself spending that kind of money on vises. 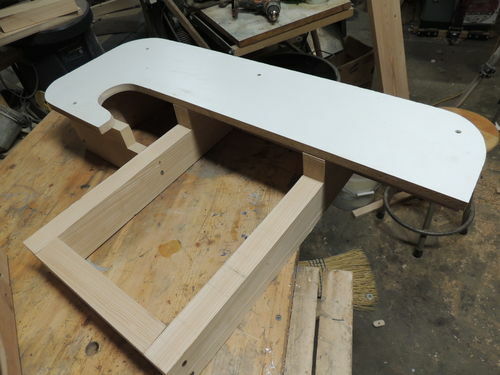 Similarly, while I initially planned on building the bench out of ash, again, the price tag was not something that I could convince myself to spend. 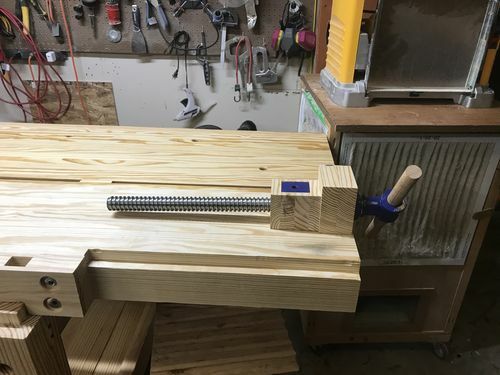 In the end, I went with Yost vise hardware and good old 2×12s from the big box stores.I started the bench in earnest in mid January, but it wasn't until I was took a vacation in early February that I really made progress. The top is 4 thick. The legs are 3 1/2 thick and 5 wide. The base is about 42 wide. I like a taller bench even though I am 5'9. The final height is 38, which seems to be pretty perfect for me.I won't go into great detail about the build, but I can tell you that there was a lot of jointing, planing and LOTS of glue. I used 2×12s that I carefully selected for grain and lack of defects. 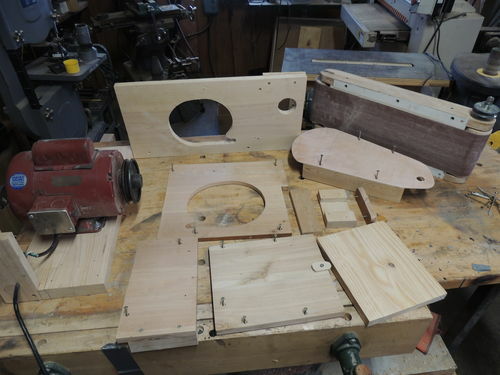 I was very selective when it came to pieces that would show to end up with clear bench top and leg faces. 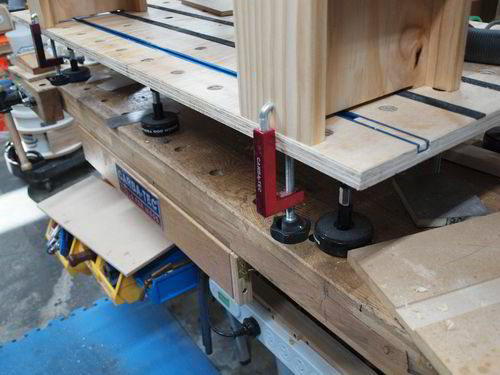 My clamps were constantly in use. 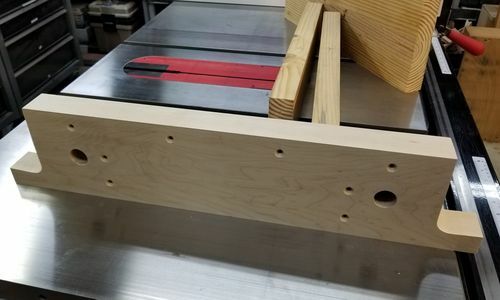 I bored the round dog holes before laminating whole sections so that I could use my drill press.The back half of the top is fairly straightforward, but the front half of the top is about 10 of solid top laminated to the square dog hole piece with a front lamination. 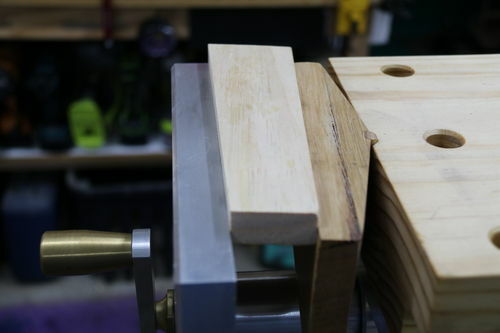 I laminated a couple of boards to get a piece 1 3/8 thick and used a router to route out the dog holes. 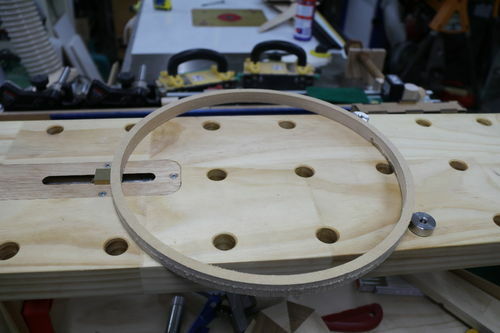 Then, I laminated another 3/8 thick piece to the front of that, followed by the front face. 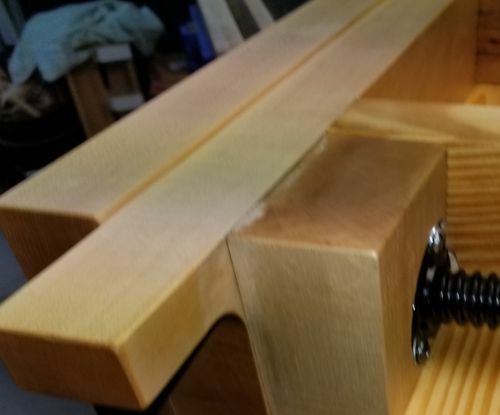 The square dogs are cut from scrap and have an ash spring to keep them from falling through the top.My top glue ups were fairly flat aided greatly by the use of my biscuit joiner. 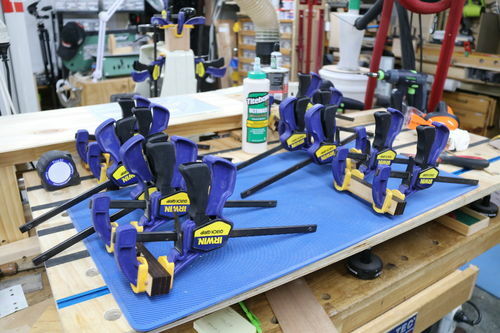 I know that a lot of people don't love the biscuit joiner, but I can say that since I picked up the Dewalt joiner in October of last year, my panel glue ups are far flatter than they were prior.The leg vise, using the Yost screw, was pretty easy. 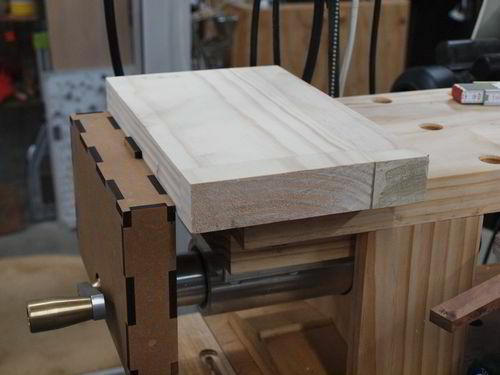 I had already constructed the chop, and it was in use on my previous bench. 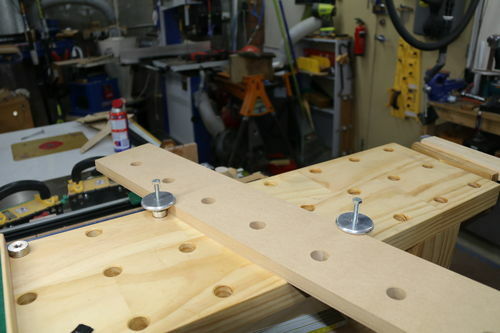 I did add the standard through leg parallel guide during the construction of the legs and base. 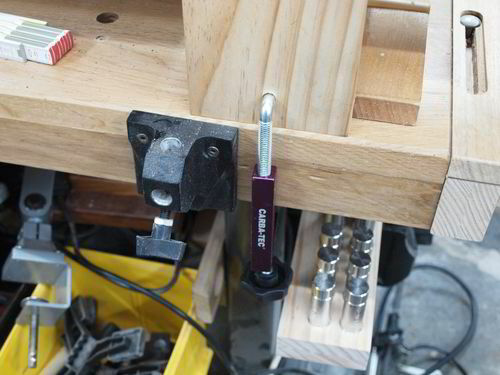 I bought a piece of 3/8 steel that I cut to size and glued into a piece of dowel for the guide pin. 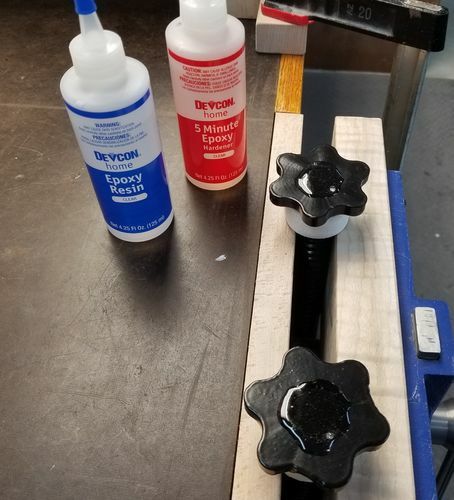 I was so pleased with the screw that I ordered the Yost end vise to include on this bench. That is where my pleasure withYost vices ended. That might actually not be fair to say. 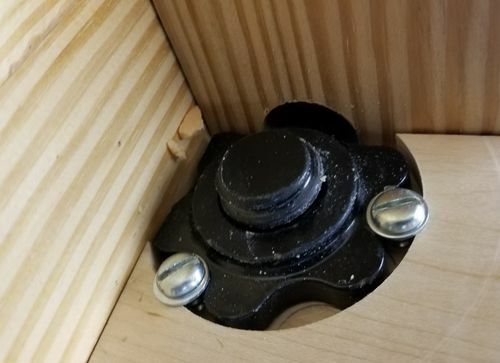 From what I can tell, there is no version of the sliding end vise available that comes with any type of clear instructions on installation. 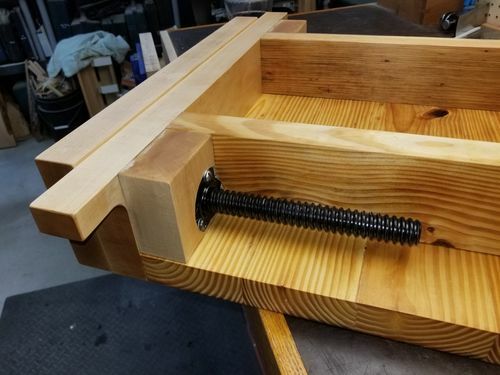 I found an article from one of the woodworking mags where the author built a bench using what appears to be the Woodcraft version of the same vise, and used that as a guide. 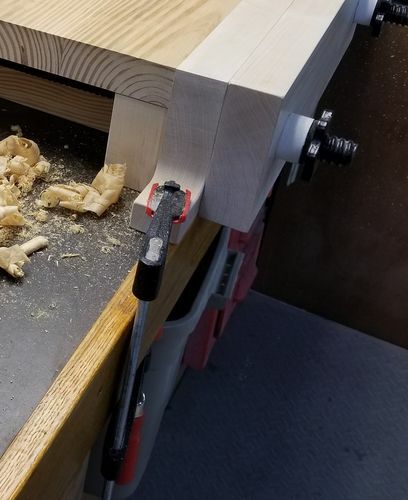 After following the included diagrams/instructions from the article, my vise did not line up properly, so I went back to the drawing board.I decided that I really only needed the vise screw, so I tossed the slide portions. 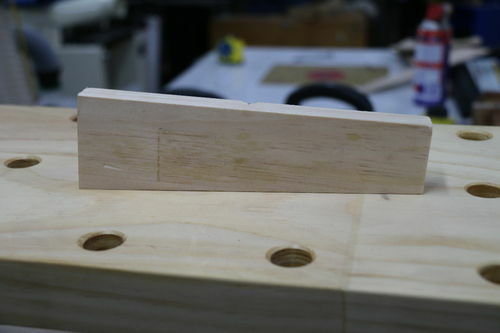 I cut a thick piece of pine that I drilled a 1 1/4 hole in to accommodate the screw, and cut out the shape of the sliding nut in another. 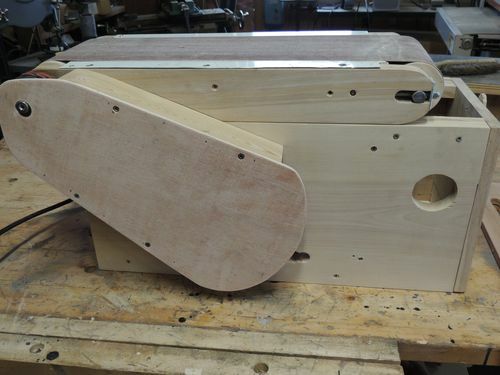 I glued on a front and back face to the nut and then I glued on a wider top piece that would hold the removeable dog and ride in the channels that I routed in the top to accept the nut. 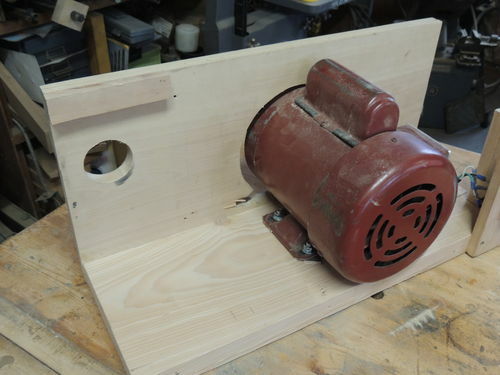 In the end, it worked out, and I am pretty happy with the way that it works.After sanding everything to 120, I gave everything a couple of coats of boiled linseed oil. 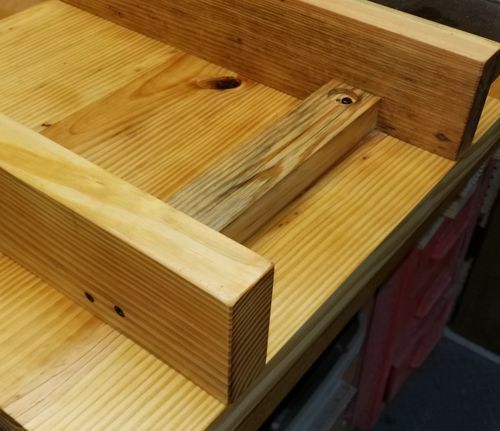 I probably will end up building a storage cabinet that will sit on the shelf below the bench top, but thought I would spend a little time working on the bench so that I have a better idea of what I want to store in that cabinet. Also, I used dowels and drawboring to complete the base assembly rather than Benchcrafted's knock down hardware.I love my new bench! It is heavy, has more features than I need, and is solid as I could hope for. The size is perfect for anything that I need it for, and I am very proud of the way that it looks. I am not sure that I will need to remove the gap stop often, but I can absolutely see that the I will use the slots for tool storage often. I also am really looking forward to having the ability to slide the gap stop over to use the slightly elevated stop as a planing stop. 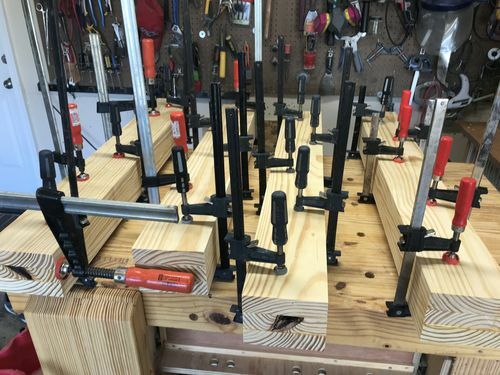 I ordered a couple of Grammercy holdfasts to provide additional workholding capabilities.In all, I probably have about $300 in the bench in wood and hardware. 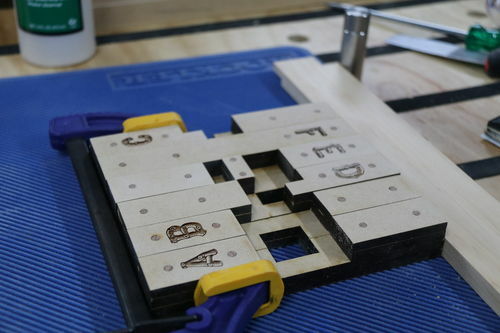 Had I gone with ash and the Benchcrafted hardware, I would have been looking at closer to $1,400. 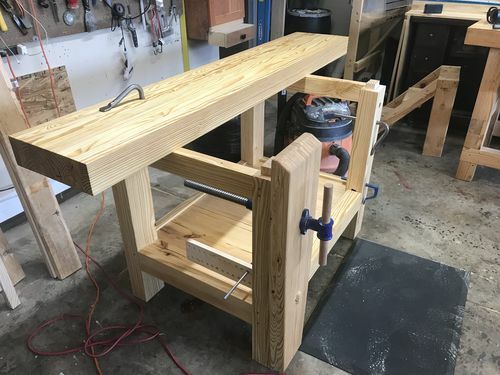 I am very happy with the end result AND I am shopping for a new 8 jointer with the savings!I am going to add several pics below from the build. Feel free to let me know if you have any questions.Thanks for looking! The turning club I attend was asked to make 50 Beads of Courage boxes. This is my contribution. Made from maple and cherry. Hopefully this will bring a smile to one child. Inexpensive version of rustic American Flag. 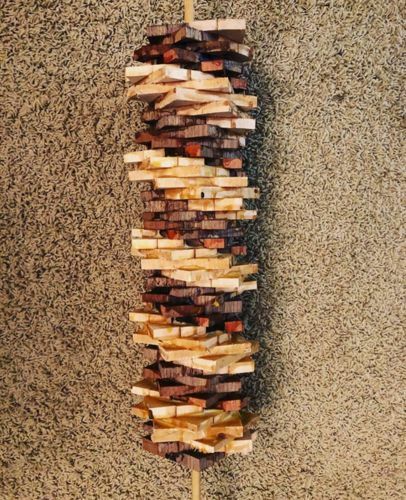 Made of 1×2 common pine furring strips. And 1×12 common pine union. 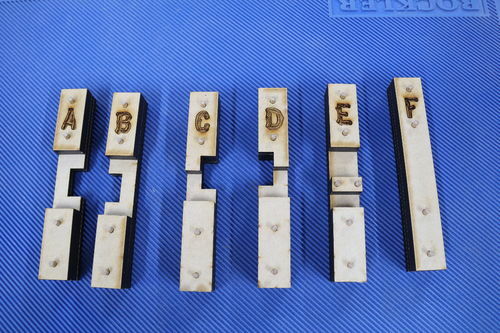 First test of the shapeoko cnc to carve union stars… (partial fail -stars came out a little wonky because the pine was so bowed) Some look small and some large. Stained and urethaned. Use pine instead of hardwood to minimise weight. 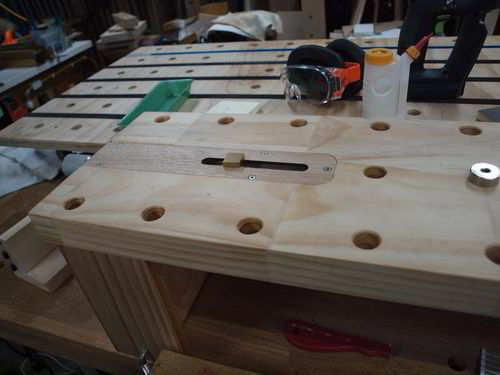 Used my UKJ Parf jig for exact placement of the dog holes rather than manual matrix layout. 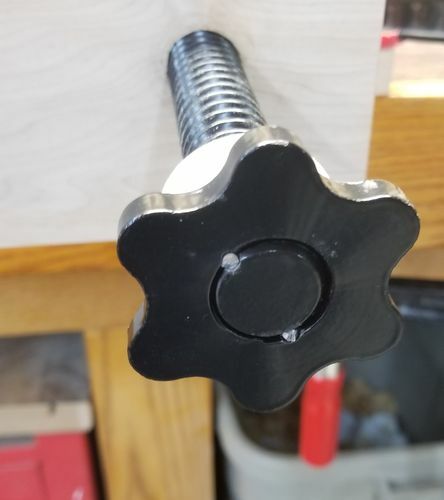 Used wood threaded 10mm stainless hex head bolts instead of coach bolts and nuts. 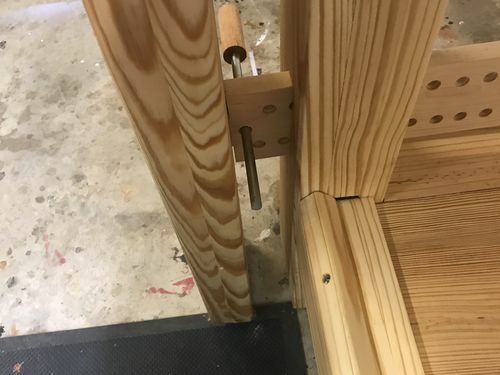 Used 6mm metal bolts with wood threads rather than screws for breakdown purposes… (done before my Domino purchase after they released their new breakdown hardware). 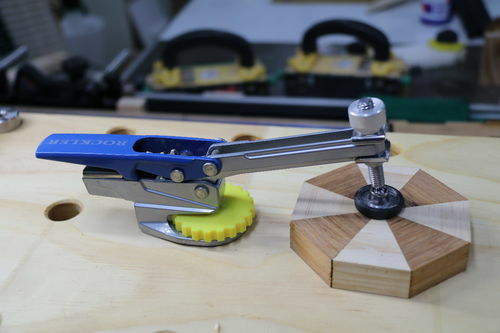 Provided for using Rockler Universal Fence Clamps rather than bulky C/F/G type clamps. 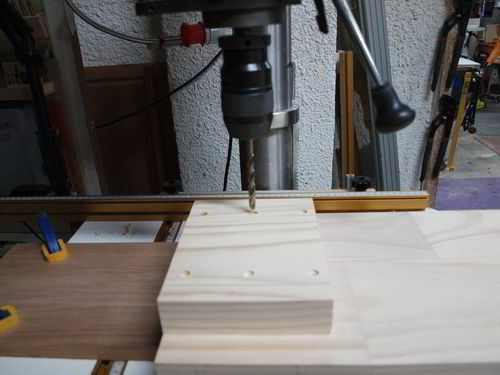 Drilled 6 guiding pilot holes. (DOH! 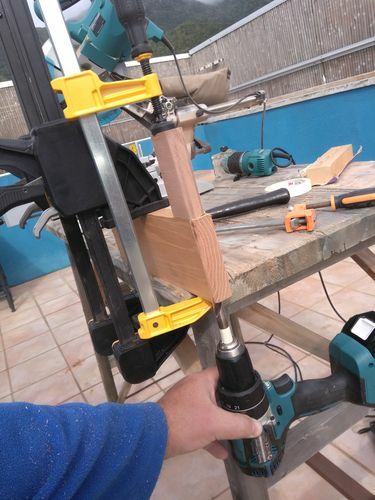 I had spare pictures)...Drilled and tapped 6 holes to accept 10mm bolts. Ratcheted in the bolts and tested squareness and operation. 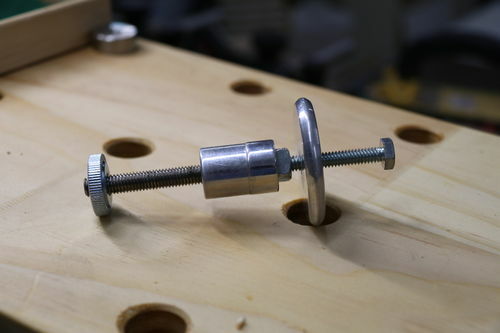 I then soaked the bolt holes with tung oil and when it came to the final bolt insertion, I had to use a pneumatic gun to seat the bolts as the buggers were fighting back against a manual wrench. Slightly concave face for rough surfaces. 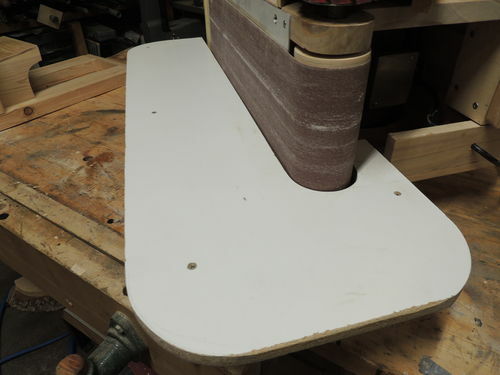 Slightly convex face for contoured surfaces. 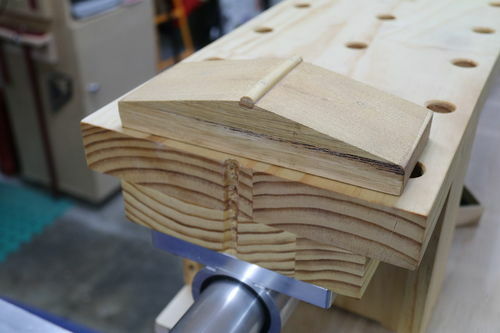 One of the features of this tail vice is it's movement. 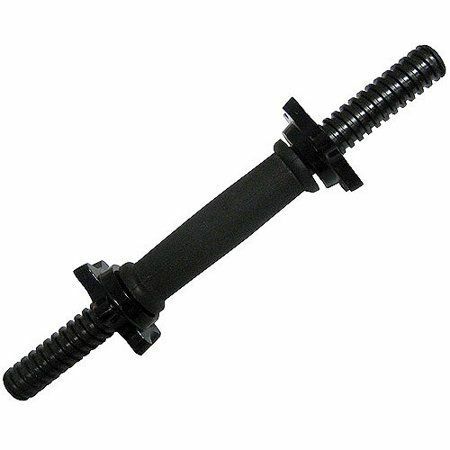 It comes with a small textured knob at the end which exerts incredible pressure with the minimum amount of force. Just two finger tightening will mar the wood if you insist on using brute force on the work to prevent any form of movement. for those times I'm too lazy to walk 2 meters to get another spare.If you look closely, here is the resting place of the old mini workbench. 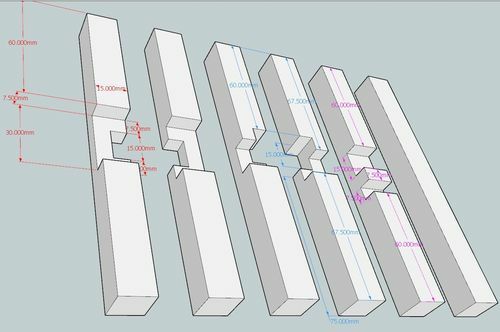 this animation of this mini workbench in SketchUp.